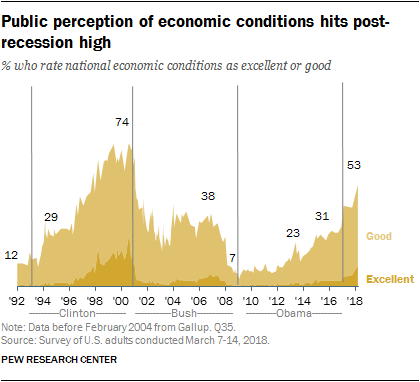 Americans’ views of national economic conditions continue to improve, with the share saying the economy is in good or excellent condition now at its highest point in nearly two decades. The overall rise in positive assessments seen over the last year is driven by the shifting views of Republicans and Republican-leaning independents. Nearly three-quarters of Republicans (74%) now view the economy in positive terms. That is a marked improvement from last October (57%). In December 2016, shortly after the presidential election, just 14% of Republicans rated the economy as excellent or good. By contrast, just 37% of Democrats say the economy is in excellent or good shape. This is modestly higher than last fall (when 30% said this), but lower than the 46% who said this in December 2016. The latest national survey by Pew Research Center, conducted March 7-14 among 1,466 adults, also finds a wider partisan difference in personal economic assessments than in recent years. Today, 62% of Republicans say their personal financial situation is in excellent or good shape, compared with 44% of Democrats who say the same. GOP views have improved substantially since Donald Trump’s election. Democratic views have changed little following the shift in administration. 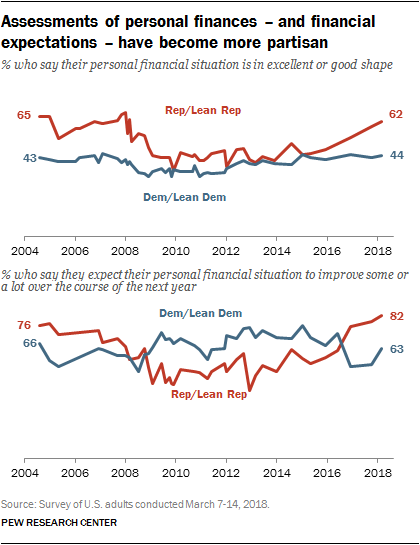 Democrats are somewhat less positive about their future personal financial situation than they were during Barack Obama’s presidency, while Republicans have become more bullish. Today Republicans are 19 percentage points more likely to say they expect their personal finances to improve over the next year (82% vs. 63%). Throughout much of Obama’s tenure, the expectations gap was the reverse. The survey finds that Americans’ views of factors affecting their personal financial pressures have changed somewhat in recent years. 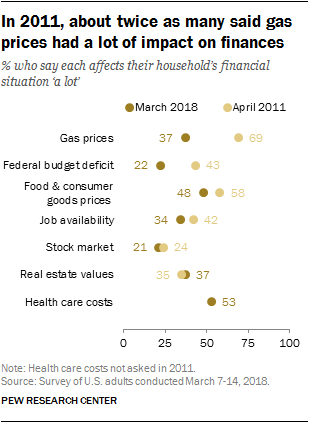 In particular, far fewer Americans (37%) say the price of gas affects their personal finances “a lot” than did so in 2013 or 2011, during periods of higher gas prices. In those years, majorities said the price of gas affected their household finances a lot (64% in 2013, 69% in 2011). Unlike overall opinions about the economy and personal financial evaluations, views of financial pressures are not all that partisan. 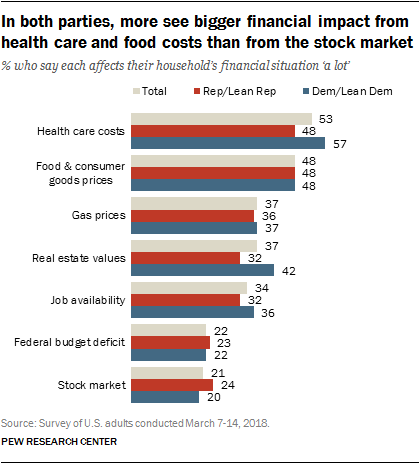 However, Democrats are more likely than Republicans to say that health care costs and real estate values affect their household finances a lot. Among members of both parties, particularly Republicans, the shares saying the federal budget deficit has a major effect on their finances is much lower today than it was in 2011. 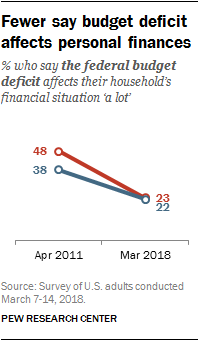 The share of Republicans who say the deficit affects their finances a lot has declined by about half since 2011, from 48% to 23%. About one-in-five Democrats (22%) also say the deficit has a big financial impact, down from 38% seven years ago. This is the latest indication of diminished public concern over the budget deficit. In Pew Research Center’s annual policy priorities survey in January, 48% of Americans said that reducing the budget deficit should be a top priority for the president and Congress, down from 72% in 2013. The decline came among members of both parties, though the shift among Republicans was more pronounced. The current survey comes 10 years after the collapse of Bear Stearns, seen by many as the moment the extent of the financial crisis became clear. In March 2008, just days after the firm’s collapse, only 11% of the public said that national economic conditions were good or excellent, while 32% said they were only fair and 56% said they were poor. The share viewing the economy in positive terms changed little over the next several years – but the share saying the economy was poor increased as the economic crisis deepened, reaching 71% in February 2009. The trajectory of these views differed for Republicans and Democrats. 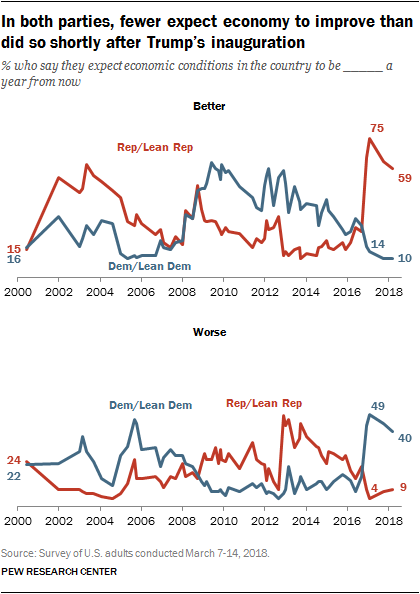 In March 2008, though few in either party had positive views of economic conditions, the assessments of Republicans and Republican leaners were somewhat more positive than those of Democrats and Democratic leaners: 23% of Republicans rated national economic conditions as good or excellent, compared with only 4% of Democrats. 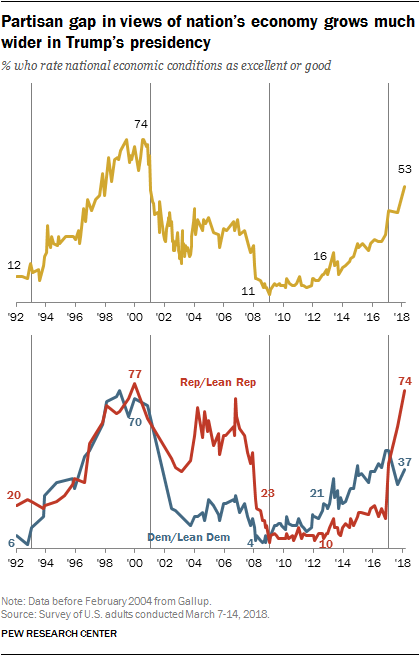 After Barack Obama took office, these views reversed, and throughout most of Obama’s presidency Democrats were more likely than Republicans to view economic conditions positively. Since Trump’s election, Republicans have grown substantially more positive about the state of the national economy. Currently Republicans are twice as likely as Democrats to say that national economic conditions are excellent or good (74% to 37%). Looking ahead, the public has mixed views of how they think the national economy will perform over the next year. While slightly more say they expect conditions to be better a year from now (34%) than worse (25%), 40% expect conditions to be about the same. While opinions about the economy are much better today than they were a decade ago, the public’s economic expectations are similar to views at that time. In March 2008, 33% expected the economy to be better a year from then, 22% worse and 39% about the same. The public became increasingly optimistic about the economy in 2008 and early 2009, as conditions worsened. But economic optimism subsequently declined. Republicans and Democrats currently have starkly different expectations. While 59% of Republicans say economic conditions will get better in a year, just 10% of Democrats say the same. Four-in-ten Democrats expect economic conditions to get worse over the next year, compared with just 9% of Republicans (31% of Republicans and 48% of Democrats expect conditions to stay about the same). While economic expectations do not differ by income in the public overall, the picture is very different within each of the two parties. Higher-income Republicans are more likely than those with lower incomes to say that they expect economic conditions to improve in the next year: 68% of those with family incomes of $75,000 or more say this, compared with 50% of those with incomes of less than $30,000. Among Democrats, the pattern is reversed; lower-income Democrats are modestly more likely to say they expect economic conditions to improve (though this view is not widely held among Democrats at any income level), and while 52% of Democrats with incomes of $75,000 or more expect conditions to worsen, that view is only held by about a third (35%) of those with lower family incomes. Republicans and Republican leaners have become significantly more optimistic about the future economy since Trump took office. Today, 59% say they expect conditions to be better a year from now. Until Trump’s election, no more than a third of Republicans had expressed this sentiment during Obama’s administration. However, the current share of Republicans expressing this optimistic view is down from the three-quarters (75%) of Republicans and Republican leaners who said this in February 2017, shortly after Trump’s inauguration. Today, 40% of Democrats and Democratic leaners say they expect conditions to get worse in the coming year, down 9 percentage points since February 2017, but still higher than at any point during Obama’s presidency. 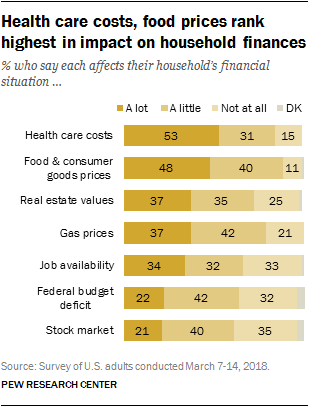 Among the factors that affect household finances, the public ranks the cost of health care and the prices of food and consumer goods highest. About half of Americans say the cost of health care affects their household’s financial situation a lot (53%), and nearly as many (48%) say the same about prices of food and consumer goods. Real estate values (37%), gas prices (37%) and the availability of jobs (34%) are mentioned by about a third of Americans as affecting their household’s finances a lot. Only about two-in-ten say the same of the stock market (21%) or the federal budget deficit (22%). Today, far fewer consider gas prices as a top pressure than did so seven years ago: In April 2011, when gas prices were far higher than they have been in recent years, fully 69% of Americans said gas prices affected their situation a lot – the highest of the six factors included in the survey. Today, the cost of health care – asked for the first time in this survey – ranks higher than most other pressures. Fewer today see the federal budget deficit as a chief concern for their household’s financial situation than did so in 2011, and the then 10-percentage-point partisan gap in assessments of its personal impact has dissipated. And while the prices of food and consumer goods remains a top pressure for household finances, the share reporting it affects them a lot has dipped 10 points since 2011, from 58% to 48%. Those who say the availability of jobs affects their finances a lot also has declined slightly from 2011, in the midst of the financial recession, when 42% said it impacted their household finances a lot. The share who say their households are affected a lot by the stock market or real estate values is little different today than it was seven years ago. There continue to be wide differences across income categories in assessments of the impact of financial pressures, but health care costs is a top household financial pressure across all income levels. About half (53%) of households earning $100,000 or more a year say it affects their financial situations a lot; about as many (52%) of those earning $30,000 a year or less say the same. On the impact of other pressures, there are some substantial differences across income groups. While about six-in-ten in lower income households say the prices of food and consumer goods impacts their finances a lot (59% of those in households with incomes of less than $30,000 a year), four-in-ten of those in higher income households say the same (40% of households making $75,000 annually or more). Gas prices are also more likely to be characterized as having a lot of impact among middle- and low-income households than higher-income households: Just 26% of those with family incomes of $100,000 or more say this, compared with about four-in-ten of those with lower family incomes. By contrast, high-earning households are more likely to see real estate values as affecting them (46% of those with family incomes of $100,000 or more a year, compared with only about a third of those with lower incomes). And while about one-in-three with family incomes of $75,000 or more (32%) say the stock market affects their households’ finances a lot, only 15% of those with lower family incomes say this.